I Grok2! – Page 10 – Except when I don’t…. 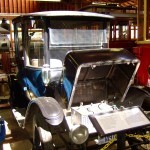 On a visit to the San Jose History Park (part of Kelley Park — Happy Hollow Zoo area in San Jose, CA), we found a refurbished/refitted electric car exhibited in the “Trolley Barn“. This car was supposedly originally manufactured and sold in the early 1900’s. 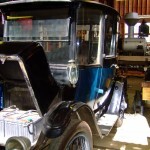 I was amazed that as early as 1907, electric cars were one of the alternative types of cars being manufactured and sold. 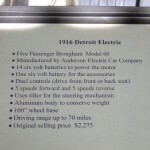 It seems like we’ve come a full circle with electric cars gaining importance now. 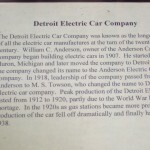 The particular model in the exhibit was called the “Detroit Electric” and sold in 1917 according to the blurb near the exhibit. See pictures below. The History Park is an amazing place to visit for history buffs and for children.